Reading and share top 28 famous quotes and sayings about Sun Moon And Stars by famous authors and people. 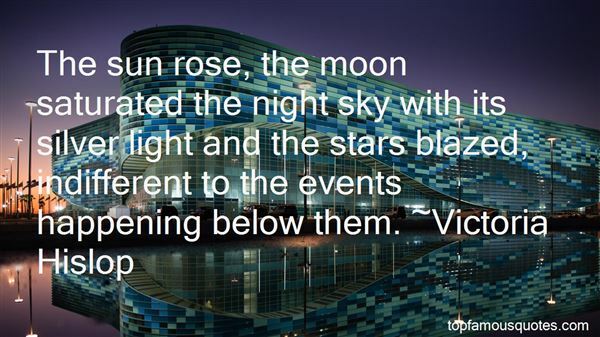 Browse top 28 famous quotes and sayings about Sun Moon And Stars by most favorite authors. 1. "Here's another change I've noticed: The dark is more than the sun dropping off, more than the moon and the stars. It's what you can't see that you hope you will see, what hasn't been that might be." 2. "Lots of people are born into lives that feel like a journey in the very middle of a big ship on familiar seas; they sit comfortably, crossing their legs, they know when the sun will rise and when the moon will wane, they have plans that they follow, they have a map! But then there are those of us, a few, who are born into lives that feel like standing at the very top of the ship's stern; we have to stand up, hold on tight for dear life, we never know when the waves will rock and we never know where the sun will set or when the moon will wane! Nothing follows the laws of common nature and we live in a wild, wild awakening and the only map we have is the map of the stars! We're called to see the lighting tear at the horizon, we're chosen to roar with the tempests, but we're also the first ones to see the suns rise, the first ones to watch the moons form anew! There is nothing ordinary, nothing at all. But neither are we! And we wouldn't want it any other way!" 3. "The girl dreams she is dangerously ill. Suddenly birds come out of her skin and cover her completely ... Swarms of gnats obscure the sun, the moon, and all the stars except one. That one start falls upon the dreamer." 4. "Suppose we have only dreamed, or made up, all those things - trees and grass and sun and moon and stars and Aslan himself. Suppose we have. Then all I can say is that, in that case, the made-up things seem a good deal more important than the real ones. Suppose this black pit of a kingdom of yours is the only world. Well, it strikes me as a pretty poor one." 5. "The Sun, Moon and Stars are there to guide us." 6. "Yours is the light by which my spirit's born: - you are my sun, my moon, and all my stars." 7. "Because God is full of life, I imagine each morning Almighty God says to the sun, "Do it again"; and every evening to the moon and the stars, "Do it again"; and every springtime to the daisies, "Do it again"; and every time a child is born into the world asking for curtain call, that the heart of the God might once more ring out in the heart of the babe." 8. "There's night and day, brother, both sweet things; sun, moon, and stars, brother, all sweet things; there's likewise a wind on the heath. Life is very sweet, brother; who would wish to die?" 9. "The sun, the moon and the stars would have disappeared long ago... had they happened to be within the reach of predatory human hands." 10. "I have, as it were, my own sun and moon and stars, and a little world all to myself." 11. "So long as a man is faithful to himself, everything is in his favor, government, society, the very sun, moon, and stars." 12. "Natures of your kind, with strong, delicate senses, the soul-oriented, the dreamers, poets, lovers are always superior to us creatures of the mind. You take your being from your mothers. You live fully; you were endowed with the strength of love, the ability to feel. Whereas we creatures of reason, we don't live fully; we live in an arid land, even though we often seem to guide and rule you. Yours is the plentitude of life, the sap of the fruit, the garden of passion, the beautiful landscape of art. Your home is the earth; ours is the world of ideas. You are in danger of drowning in the world of the senses; ours is the danger of suffocating in an airless void. You are an artist; I am a thinker. You sleep at your mother's breast; I wake in the desert. For me the sun shines; for you the moon and the stars." 13. "Lorenzo il Magnifico, the Plato Four, the humanists had taught him that man was the center of the universe; and this was never more demonstrable that when he stood looking upward and found himself, a lone individual, serving as the central pole holding up the tarpaulin of sun and clouds, moon and stars, knowing that, lone or abandoned as he might feel, without his support the heavens would fall." 14. "I sang of leaves, of leaves of gold, and leaves of gold there grew:Of wind I sang, a wind there came and in the branches blew.Beyond the Sun, beyond the Moon, the foam was on the Sea,And by the strand of Ilmarin there grew a Golden Tree.Beneath the stars of Ever-eve in Eldamar it shone,In Eldamar beside the walls of Elven Tirion.There long the golden leaves have grown upon the branching years,While here beyond the Sundering Seas now fall the Elven-tears.O Lórien! Too long I have dwelt upon this Hither ShoreAnd in a fading crown have twined the golden elanor.But if of ships I now would sing, what ship would come to me,What ship would bear me ever back across so wide a Sea?" 15. "Lady Dance's music wasn't a magic charm. I'd misunderstood. We had all failed to understand. The song and dance didn't stop us dying. It just stopped the fear of death swallowing us up while we were still alive. 'Rejoice,' came the soft voice of Lady Dance in my mind. 'Watch the moon and stars...' Death had ruled my life till I met Lady Dance. Her dance had set me free." 16. "Then God said, "Let there be lights in the firmament of the heavens to divide the day from the night; and let them be for signs and seasons." The Hebrew word for "sign" is owth, which also translates as "signals." 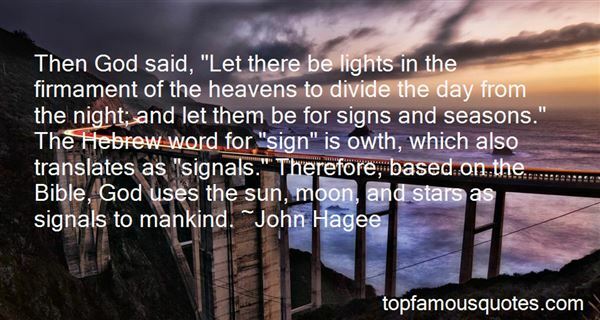 Therefore, based on the Bible, God uses the sun, moon, and stars as signals to mankind." 17. "As jolaha ka maram na jana, jinh jag ani pasarinhh tana;dharti akas dou gad khandaya, chand surya dou nari banaya;sahastra tar le purani puri, ajahu bine kathin hai duri;kahai kabir karm se jori, sut kusut bine bhal kori;No one could understand the secret of this weaver who, coming into existence, spread the warp as the world; He fixed the earth and the sky as the pillars, and he used the sun and the moon as two shuttles; He took thousands of stars and perfected the cloth; but even today he weaves, and the end is difficult to fathom.Kabir says that the weaver, getting good or bad yarn and connecting karmas with it, weaves beautifully." 18. "Little girl, little boyIf love has a wayFill their fields with laughterAnd scatter the sun on their dayAnd if it should happen to rainMake their raindrops kissesStraight from heaven aboveThat touch their hands and facesAnd that fill them with loveAnd make the moon reflect their smilesAnd their stars plentyAnd, above all, keep them togetherAnd hold them as you mayForever and everUntil their last day." 19. "When he couldn't walk anymore he sailed, and when he couldn't sail anymore he was at the End of the World, where sat a dignified man in a dinner suit, dangling his long legs over the edge. He was patting his lapels and turning out his pockets and looking generally perplexed. "Bother," said the well-dressed man. 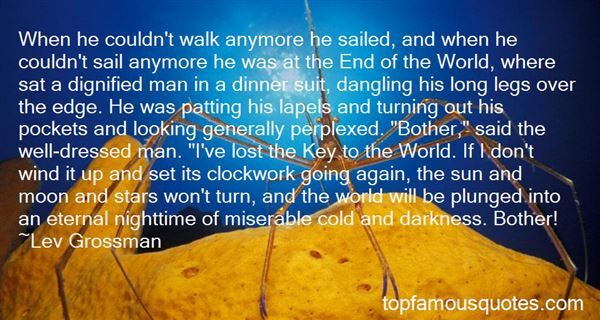 "I've lost the Key to the World. If I don't wind it up and set its clockwork going again, the sun and moon and stars won't turn, and the world will be plunged into an eternal nighttime of miserable cold and darkness. Bother!" 20. "MAMBO SUN""Beneath the bebop moon I want to croon with you Beneath the Mambo Sun I got to be the one with you My life's a shadowless horse If I can't get across to you In the alligator rain My heart's all pain for you Girl you're good And I've got wild knees for you On a mountain range I'm Dr. Strange for you Upon a savage lake Make no mistake I love you I got a powder-keg leg And my wig's all pooped for you With my hat in my hand I'm a hungry man for you I got stars in my beard And I feel real weird for you Beneath the bebop moon I'm howling like a loon for you Beneath the mumbo sun I've got to be the one for you"
21. "You can say the sun is shinning if you really want toI can see the moon and it seems so clearYou can take the road that takes you to the stars nowI can take the road that'll see me through"
22. "I bind the Sun's throne with a burning zone, And the Moon's with a girdle of pearl; The volcanoes are dim, and the stars reel and swim, When the whirlwinds my banner unfurl." 23. "No, no- the sky will grow dark, cold rain will fall and all trace of the right way will be blotted out. You will be all alone. And still you will have to go on. There will be ghosts in the dark and voices in the air, disgusting prophecies coming true I wouldn't wonder and absent faces present on every side, as the man said. And still you will have to go on. The last bridge will fall behind you and the last lights will go out, followed by the sun, the moon and the stars; and still you will have to go on. You will come to regions more desolate and wretched than you ever dreamed could exist, places of sorrow created entirely by that mean superstition which you yourself have put about for so long. But still you will have to go on"
24. "And when we give each other Christmas gifts in His name, let us remember that He has given us the sun and the moon and the stars, and the earth with its forests and mountains and oceans--and all that lives and move upon them. He has given us all green things and everything that blossoms and bears fruit and all that we quarrel about and all that we have misused--and to save us from our foolishness, from all our sins, He came down to earth and gave us Himself." 25. "The little space within the heart is as great as the vast universe. The heavens and the earth are there, and the sun and the moon and the stars. Fire and lightening and winds are there, and all that now is and all that is not." 26. "SUN, MOON, AND STARRY SKYEarly summer evenings, when the first stars come out, the warm glow of sunset still stains the rim of the western sky.Sometimes, the moon is also visible, a pale white slice, while the sun tarries.Just think -- all the celestial lights are present at the same time!These are moments of wonder -- see them and remember." 27. "The sun rose, the moon saturated the night sky with its silver light and the stars blazed, indifferent to the events happening below them." 28. "This is the excellent foppery of the world, that,when we are sick in fortune,--often the surfeitof our own behavior,--we make guilty of ourdisasters the sun, the moon, and the stars: asif we were villains by necessity; fools byheavenly compulsion; knaves, thieves, andtreachers, by spherical predominance; drunkards,liars, and adulterers, by an enforced obedience ofplanetary influence; and all that we are evil in,by a divine thrusting on: an admirable evasionof whoremaster man, to lay his goatishdisposition to the charge of a star." The soul is the ancestral animals. The body is their knowledge."